It's no secret I love Asian cookbooks. I could cook and eat Asian food every day. Diana Kuan's The Chinese Takeout Cookbook has a spot in my kitchen bookcase. The kitchen bookcase consists of three shelves for those books I use frequently, and the space is limited. Space there is comparable to a New York rent controlled apartment in a nice building. 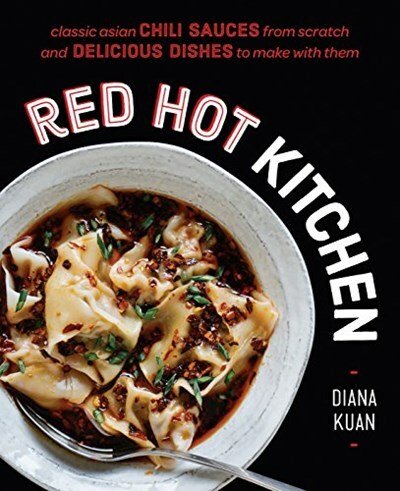 Diana's second cookbook, Red Hot Kitchen: Classic Asian Chili Sauces from Scratch and Delicious Dishes to Make with Them will sadly evict some unsuspecting lesser used book from its spot on the coveted kitchen bookcase. It is that good. Red Hot Kitchen devotes itself to from scratch chili sauces and dishes to highlight those sauces. Diana offers easy-to-follow recipes for nine sauces fundamental to Asian cuisine, along with a Know Your Chili Pepper chart so you can easily shop for the ingredients you need and customize the heat level of each sauce. 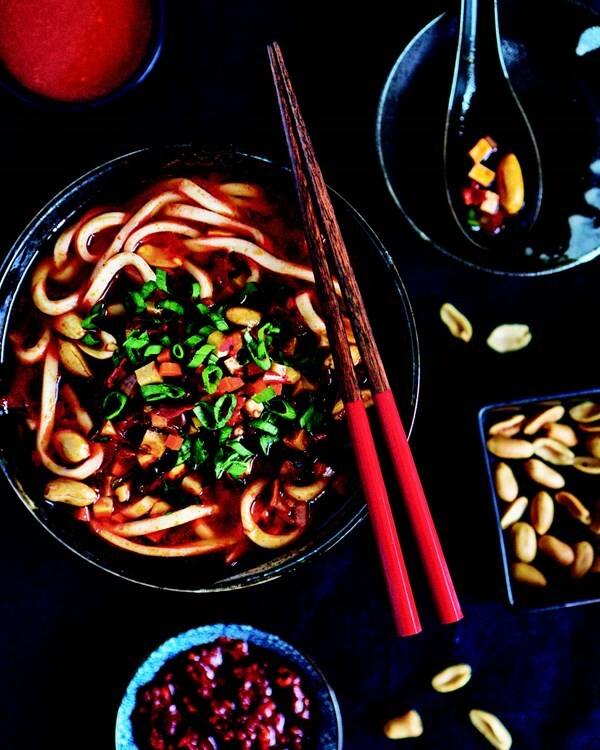 Each chapter then offers recipes incorporating each spicy sauce, broadening the range of Asian dishes you can cook at home. The sauces covered here are Sambal oelek, Sriracha, Nam prik pao, Thai red curry paste, Sweet chili sauce, Sichuan chili oil, XO sauce, Gochujang and Yuzu Kosho. Also shared is a chapter on cooling drinks and another on supplemental recipes for rice sides and stocks. Diana beautifully ties up the book with recommended menus such as "Lunar New Year" or "Korean Feast" along with indicators for which dishes are vegetarian. I have made the Chongqing chicken which I could eat every week as it is incredibly tasty and relatively easy. Our Eat Your Books Cookbook Club is going to cover this flavor packed book in June. Order your copy now, you will not want to miss out! Special thanks to Avery Books, the publisher, for sharing this recipe with our members today and for providing three copies in our giveaway below. The publisher is offering three copies of this book to EYB Members in the US. One of the entry options is to answer the following question in the comments section of this blog post. Be sure to check your spam filters to receive our email notifications. Prizes can take up to 6 weeks to arrive from the publishers. If you are not already a Member, you can join at no cost. The contest ends at midnight on May 15th, 2019. Recipe excerpt from Red Hot Kitchen by Diana Kuan, Copyright 2019 and used with permission from Avery Books. I would like to make Spicy peanut ginger cucumber cups first. The classic pad kee mao! Sriracha lime garlic wings. Yum! Fresh cucumber kimchi to go with all the cukes I'm planting! So hard to choose which would be first but I think it would be her Sriracha. Always looking to improve my recipe. Definitely start with my own nam prik pao! That stuff is amazing. Cumin crusted rack of lamb!